The Conveyer Belt Sushi Experience! Sushi has been one of the most popular and widely known food from Japan. And the Conveyer belt Experience was a thrilling experience. First get seated on the table and then you have a option of choosing what you would like to order from the tablet kept on the table or just picking up what you like. The food all Different types of Sushi & Japanese food are doing the rounds on a Conveyer belt,like the ones that take our bags around in the airport. If you like a particular sushi tuna,Squid,Eel or Tempura prawns just lift them from the belt and keep them on the table,Nobody will screams it’s mine like they do in airport if you have identical bags. Here the pricing of plates are done by designs. The checkered ones are the most expensive to the Red and blues being affordable. Once you are done with all your bingeing you ask for the Cheque by clicking on the tablet. And then the total is done by multiplying the Type of plates x quantity. The whole experience,Could be technical as you wouldn’t be used to the idea or might be new! But going with a local or asking a local would be the best thing. 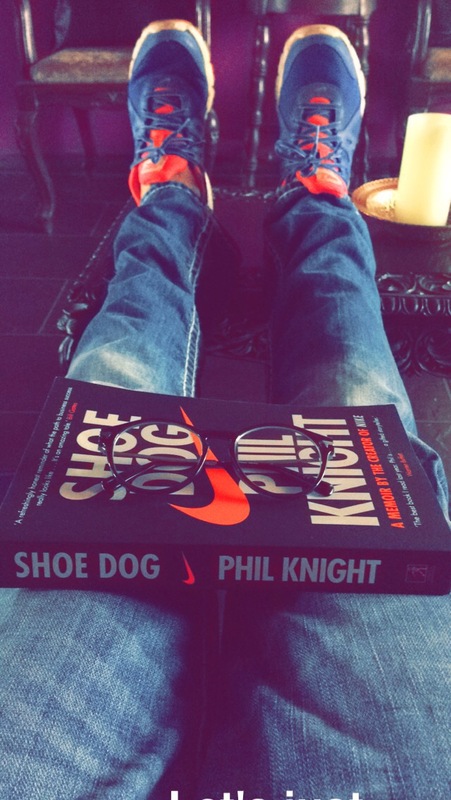 PHIL KNIGHT- SHOE DOG, A Book that was on my reading list, ever since I viewed the Interview of phil Knight on the charlie Rose show and immediately,Wanted to read it.But, Till the time I actually bought the book, I read the repeated article appearing in leading newspapers. “The Best Book I read last Year.Phil is…A gifted storyteller”- Warren Buffet . There is so, little we all know about Nike ,And are totally oblivious who is Phil Knight ? months later.I Read the book,And The way the book was structured,Like a suspenseful novel. Putting on the right shoe before the left will bring prosperity -Romans believed before caesar period. China: did you know that when man marries woman,They throw red shoes on the roof to make sure all goes well on wedding night! And Did you know when someone starts a journey,It’s actually good luck to throw shoe at them in China To Bowerman one of the most important men in the nike journey. Blue Ribbion the brand and company founded by Phil knight,Before Nike was born,Actually distributed Onituska Tiger shoe. The term ‘Shoedog’ is an Slang name given to a veteran of the footwear industry. Someone who has dedicated their life to selling Shoes. 1966 Blue ribbon,The company before Nike was born opened the first ever retail store Santa Monica . 1977-Air shoes were coming up. Denny Strickland creative director designed NIKE Font. Sandals discovered in 1938 the year Phil knight was born . Oldest shoe ever discovered are from Oregon 9000 years ago.